Over the past few days graffiti scrawled on walls around the mixed Jewish and Arab town of Jaffa in central Israel exclaims: “Settlers, keep out” and “Jaffa is not Hebron”. Although Jaffa is only a stone’s throw from the bustling coastal metropolis of Tel Aviv, Arab residents say their neighbourhood has become the unlikely battleground for an attempted takeover by extremist Jews more familiar from West Bank settlements. Small numbers of nationalist religious Jews, distinctive for wearing knitted skullcaps, have begun moving into Jaffa’s deprived main Arab district, Ajami, over recent months. Tensions have been simmering since a special seminary was established last year in the heart of Ajami for young Jewish men who combine study of the Bible with serving in the Israeli army. Many such seminaries, known as “hesder yeshivas”, are located in the occupied territories and have earnt a reputation for turning out extremists. Last week Ajami’s residents were dealt a further blow when an Israeli court approved the sale of one of the district’s few remaining building plots to B’Emuna (Hebrew for “with faith”), a construction company that specialises in building subsidised homes for religious families, many of them in West Bank settlements. The Association of Civil Rights in Israel, the country’s largest human rights law centre, which petitioned the courts on the Arab residents’ behalf, called the company’s policy “racist”. B’Emuna, which is expected to complete 20 apartments in the next few months, is applying for approval for a further 180, as well as a second seminary and a synagogue. “We have no problem living peacefully with Jewish neighbours,” said Omar Siksik, an Arab councillor representing Jaffa in Tel Aviv’s municipality. 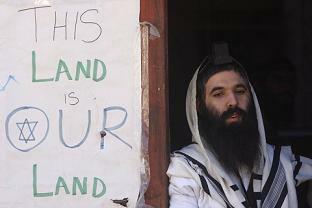 “But these Jews are coming here as settlers. “Like in Hebron, their policy is to weaken us as a population and eventually push us out of our homes,” he said, referring to a West Bank city where an enclave of a few dozen settlers has severely disrupted life for tens of thousands of Palestinians. Jaffa’s fortunes have changed dramatically since early last century when it was the commercial hub of Palestine, famously exporting its orange crop around the world. During Israel’s founding in 1948, most of the town’s Palestinians were expelled or forced to flee, with the few remaining inhabitants confined to Ajami. Today, Jaffa’s 18,000 Arab inhabitants are outnumbered two to one by Jews, after waves of immigrants were settled in empty homes during the 1950s. Arab residents have long complained of being neglected by a municipality controlled from Tel Aviv. Ajami’s crumbling homes, ramshackle infrastructure and crime-ridden streets were on show in this year’s much-feted eponymous movie, nominated for an Oscar as best foreign-language film. But the latest arrivals in Ajami are causing considerable anxiety, even from officials in Tel Aviv. Gilad Peleg, head of the Jaffa Development Authority, said he was “deeply concerned” at the trend of extremist organisations arriving “to shake up the local community”. But despite widespread opposition, the Tel Aviv District Court last week rejected a petition from 27 residents who argued that the Israel Lands Authority had discriminated against them by awarding the land to B’Emuna, even though its policy is to build apartments only for Jews. Yehuda Zefet, the judge, accused the residents of “bad faith” in arguing for equality when they wanted the interests of the local Arab community to take precedence over the interests of Jews. Fadi Shabita, a member of the local Popular Committee for the Defence of Jaffa’s Lands, said the plots in Ajami being sold by the government originally belonged to Palestinian families, some of whom were still in the district but had been forced to rent their properties from the state. “The land was forcibly nationalised many years ago and the local owners were dispossessed,” he said. “Now the same land is being privatised, but Ajami’s residents are being ignored in the development plans. B’Emuna told Israel National News, a settler website, that it was developing Jewish-only homes in several of the half dozen “mixed cities” in Israel to stem the flow of Jewish residents leaving because of poverty and falling property values caused by the presence of an Arab population. B’Emuna has said it is looking to buy more land in Jaffa. A short distance from the olive grove that is about to be developed is the Jewish seminary established last year. An Israeli flag is draped from the front of the building and stars of David adorn the gate at its entrance. The manager, Ariel Elimelech, who was overseeing two dozen young men on Sunday as they pored over the Torah, said he commuted daily to Ajami from his home in Eli, an illegal settlement deep in the West Bank south of the Palestinian city of Nablus. Mr Elimelech said he favoured coexistence in Jaffa but added that the seminary’s goal was to strengthen Jewish identity in the area. “We don’t call this place Ajami; it’s known as Givat Aliyah,” he said, using a Hebrew name that refers to the immigration of Jews to Israel. He said the students performed a vital service by visiting schools to help in the education of Jewish children before performing 18 months of military service. Kemal Agbaria, who chairs the Ajami neighbourhood council, said residents would launch an appeal to the Supreme Court and were planning large-scale demonstrations to draw attention to their plight.